International Journal of Health Services Research and Policy (IJHSRP) serves all those directly involved in, or concerned with, health services, health management, hospital administration, health policy and public health. The aim of this journal is to provide a peer-reviewed forum for health researchers and academics from all countries to share and discuss new issues and amendments in health related problems. 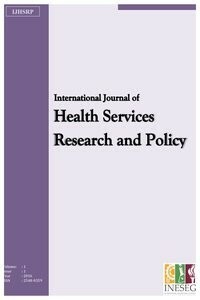 International Journal of Health Services Research and Policy welcomes applied researches, case studies and reviews regarding scope of the journal.